” We should be embarrassed that Aboriginal Australians have the world’s worst incidence of middle ear infection and the worst deafness rates because of those infections. More than 90 per cent of young Aboriginal children have hearing-aid-level deafness for much of the year and 35 per cent of central Australian Aboriginal children have perforated eardrums at any one time. Aboriginal children develop ear infections at a younger age and are affected more severely ­than any other racial group in the world by a factor of up to three. They have harmful bacteria colonising their nose and throat very early in life. The ear infections cause a build-up of infective fluid behind the eardrums that frequently burst and result in holes in these eardrums and a purulent discharge from the ears. These eardrum perforations often do not heal and the infection can dissolve the tiny middle ear bones called the ossicles, which conduct sound to the hearing nerves. The partial deafness from infections is devastating to a child’s language development, ­especially where English is the second language. Children who are partially deaf never fully understand the spoken word. They find it difficult to follow conversations and to listen to what a teacher is saying. They become easily bored and disillusioned at school – that’s why we see the high rates of truancy and illiteracy among them. Poor educational results lead to poverty and high unemployment levels. If you are illiterate it is hard to move away from an isolated community with high unemployment, violence and substance abuse issues. Damien Howard, the distinguished academic psychologist from the Northern Territory, has documented the association of deafness in Aboriginal communities with violence, substance abuse, mental illness, suicide and the high rates of Aboriginal incarceration, especially in juvenile ­detention facilities. Many ear, nose and throat surgeons, whom I represent, pediatricians, audiologists, education­alists and Aboriginal health workers have been involved in the research of this problem as well as the important provision of interventions that help mitigate the far-reaching, devastating consequences of this true pandemic. Multiple health department jurisdictions, health regions, universities and medical centres across rural and outer suburban Australia are aware of the issue but still today these well-intentioned ­interventions are largely untested, not always evidence-based and are rarely benchmarked. The terrible images from the Don Dale Youth Detention Centre and the high rates of Aboriginal incarceration have been brought to the attention of ordinary Australians who, through the years, have grown accustomed to tales of truancy, substance abuse, overcrowding and youth suicide. The association of deafness as an important but remediable root cause has been unaccountably ­ignored, especially in Closing the Gap strategies, and unfortunately this reflects badly on us, the health practitioners and researchers who should be advocating for adequate treatment of this condition. There is no shortage of surgeons, pediatricians, audiologists, speech therapists, educationalists and health workers wanting to help. States and territories need to come together to finance interventions that work. Sound amplification systems in classrooms, hearing aids where appropriate, the training of teachers going to communities on how to teach a class of deaf kids, timely and appropriate GP and primary healthcare interventions, and timely surgery and vaccinations within the communities do work. Preventive action and early treatments are extremely cost ­effective when considered against the effects of hearing impairment. It costs up to $60,000 to lock up a child for a year, and that is often followed by a life of welfare dependency. 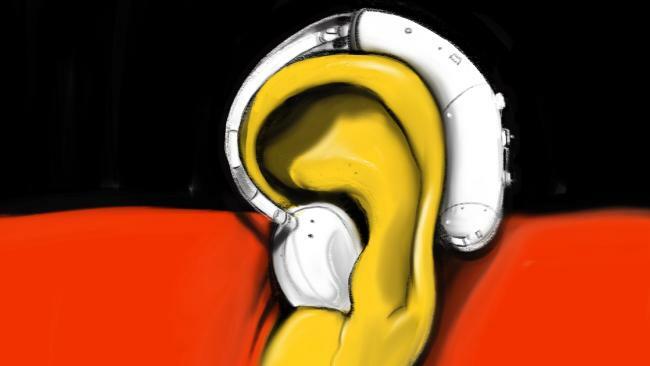 Australia would save a great deal of money and raise health and wellbeing among ­Aboriginal Australians by making ear health a priority. A recognition of the consequences of inaction on Aboriginal deafness and the risk this poses to making any progress to closing the gap is essential. It should never be normal for people to have to suffer with ear disease and deafness. I am encouraged that this past year we have had a strong show of support from parliamentarians in Canberra and across several states and territories who have pledged their support to making Aboriginal ear disease a thing of the past. To close the gap in health, we need a definitive ­national approach to address the Aboriginal ear disease crisis. The Ear Health for Life campaign that will be launched this year will draw together stakeholders from the health, social services, education and government sectors. It will raise awareness of this terrible problem, encourage preventive and early intervention action, and advocate for a co-ordinated national approach. Chris Perry is president of the Australian Society of Otolaryngology Head and Neck Surgery.